My Daughter has become quite the little fundraiser! When I was in hospital she wanted to give all her money to the nurses as they were the ones looking after me! I then explained to her how raising money for charities works and where the money donated goes. To her it was simple, give her money to the people who were helping to make me better! The first thing she wanted to so was make loom band bracelets to sell at the local Race for Life. We came up with the idea of making orange and white ones as this is the colour of Leukaemia. Imogen, Ella and I made lots and lots of them, it gave me something to do while I was in hospital! They sold all of them at the Race for Life and the money was given to Cancer Research UK. 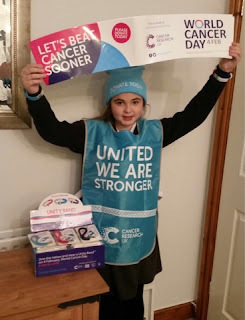 When World Cancer Day came up Imogen decided she wanted to sell the Unity Bands and between us we raised nearly £200. Every day after school she would come home with a list of names of children who wanted to buy one. Thanks to a local contact who really helped us we managed to keep up with demand but only just. 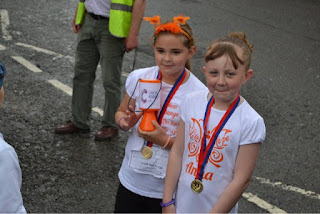 He also provided Imogen with a hat, bib and banner which she was really happy to wear. 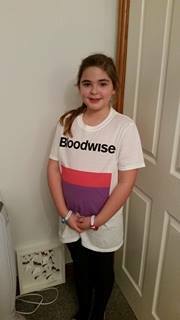 After this Imogen decided she would also like to sell Bloodwise pin badges at her school so once we had their permission she started planning her campaign. With the help of her cousin, Ella, they decided on a script of what they wanted to say to the children about blood cancer and Bloodwise. The school were really supportive and allowed them to have time out of their classes to go around each year group. This was really brave of her and was all her own idea. 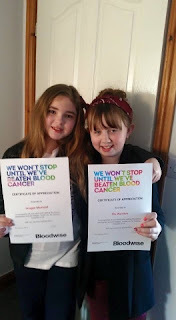 In total £160 was raised, Bloodwise were really pleased and sent the girls a certificate of appreciation. My Husband and I are really proud of her and are so happy to see her getting something positive out of what has been a very traumatic experience for her. It is a great life lesson for her and has helped her self confidence. I am sure she will be doing lots more fundraising in the future. Previous Post Blood Cancer – The Sneaky One! Next Post More about Bloodwise!